i didn't know this before visiting, but apparently ice cream is kind of a big deal in seattle? like, long lines at all the places. anyway, there were two must stop at ice cream shops for me in seattle. the first was molly moon's homemade ice cream. "come for the ice cream, stay for the charm of our scoop shops. ... our daily menu offers fourteen tempting flavors to satisfy every sweet tooth : ten "always" flavors that we churn year-round & four seasonal options that rotate with what's fresh in the northwest." the vegan options falls under the four seasonal options category. so many important items to bring up ... first, i don't like coffee. yet, was so tempted to try this. i think it was the allure of the chocolate drizzle. & because my bestie reminded me she also hates coffee, but loves chocolate ice cream. so i went for it. second, this was soooo good. like, so good. like could convert me to liking coffee. not going to lie, before trying this, i was disappointed that the vegan flavor was coffee. but only because i heard that before this, the previous vegan flavor was mint. that one sounded so good. but, luckily the coffee was outstanding. 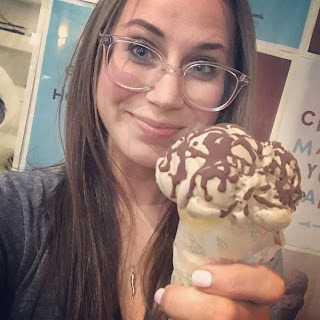 my next seattle ice cream post is from a completely plant-based, vegan joint. so get pumped! until them, dream about this vegan coffee ice cream cone ... i have been.